This is a big surprise! Ola, who recently acquired TaxiForSure have diversified into fast growing online food delivery business. 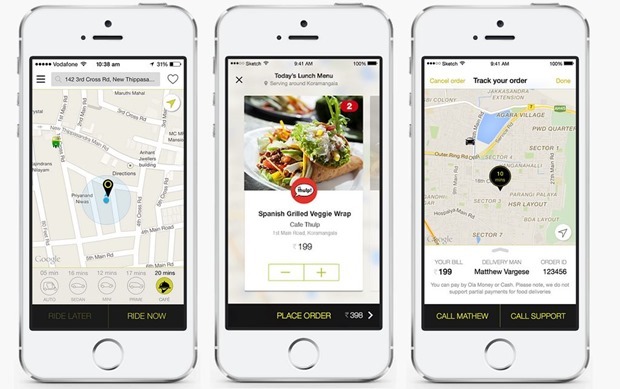 They have launched Ola Café, a food delivery service where customers can order food through OLA mobile app from restaurants in the near vicinity! What’s more, the food you order from Ola Café will be delivered to you in less than 20 minutes. The service is currently available in four Indian cities of Bangalore, Hyderabad, Delhi and Mumbai. Also, the service will be available only during stipulated time for Lunch, Dinner and evening snacks. It looks like Ola has taken inspiration from their competitor Uber, who had launched UberFRESH online food delivery service last August in US. While not much has been talked about how successful this service has been, given the fact that they are expanding it to other places points to fact that it is doing well. If you want check out Ola Café, just download the latest Ola app from Play store or App store and select Café menu at the bottom right of the app screen. You can then check out available menu’s and place your orders. The good thing is that the food will be sent to you in less than 20 minutes. The new service is obviously targeted at corporates and professionals who want to order food from outside at their office. Even in the four cities of Bangalore, Hyderabad, Delhi and Mumbai, the service caters only to selected few areas, because of which it is possible for Ola Café to deliver the food in such a short time. Here are the areas where Ola Café is offering this service. User who order food from Ola Café can either pay through the Ola Money wallet or pay cash on delivery. Currently, they do not support part Ola money, part cash transactions. Interestingly, the delivery address for the food is picked up depending on your location which app registers based on GPS co-ordinates, exactly like it happens when you hail a cab. One thing is not clear – Whether the food deliveries happen through Ola cabs or not! In our view, it would be quite expensive to use a cab to ferry food for customers. However, currently this clarification is not forthcoming. Why Has Ola launched Ola Café? This is a big question – because, in India, still large swaths of cab market are still untapped and Ola is growing quite aggressively, be it organically or inorganically. Then why dilute the focus and move into food delivery business? Firstly, India’s food delivery market is red hot right now. Online food delivery niche grew 40% in the last 12 months, which makes it the fastest growing segment of the Indian ecommerce space. Secondly, Ola has loads of money in the bank currently and are growing at aggressive pace. They want to go beyond just providing cabs, and probably utilize their existing network for offering other services. What better niche than food delivery business which is not such a capital intensive business and yet has huge potential. Thirdly, as mentioned above, Uber, their biggest competitor, has already done it successfully in the US. They want to replicate the same model here, and want to go one up before Uber launches the same here in India. All in all, this seems to be a good move by Ola which will not only aid their growth but also diversify their business! Do let us know what you think about this launch. "Surprise! Ola Launches Ola Café, An Online Food Delivery Service", 5 out of 5 based on 1 ratings.